Butler’s Clay Colton battles for possession during Troy’s 1-0 win at Butler on Tuesday. Keegan Hadder advances the ball during Troy’s 1-0 win at Butler on Tuesday. Ryan Davis (7) looks to gain possession as Chris Mitrousis (9) looks on during Troy’s 1-0 win at Butler on Tuesday. Zane Burgmeier advances the ball during Troy’s 1-0 win at Butler on Tuesday. 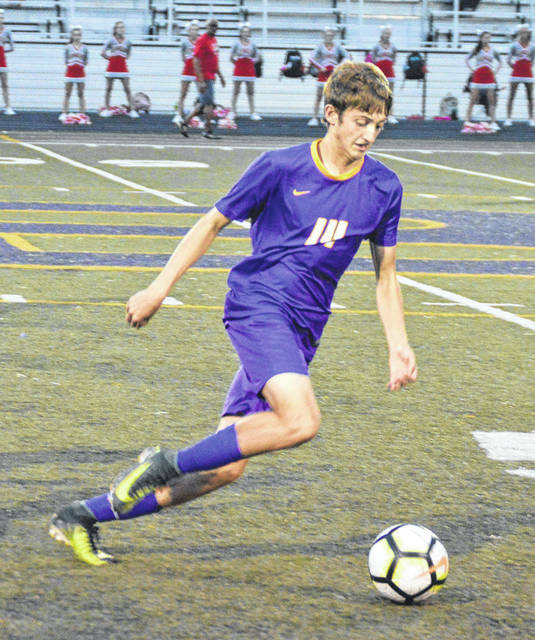 VANDALIA — The Butler boys soccer team entered Tuesday’s game with Troy looking to remain unbeaten and take a leg up in the Greater Western Ohio Conference North Division title race. 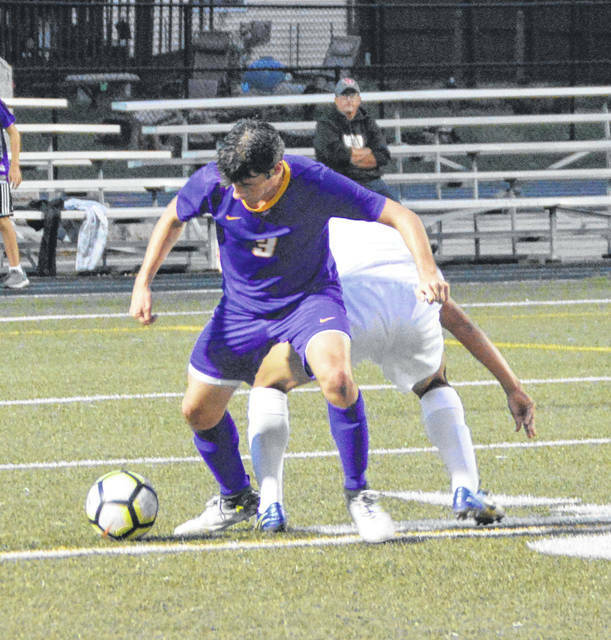 Instead, with a stout wind at their backs, Troy scored the game’s only goal on a thrown in late in the first half and then made that stand up in a 1-0 victory on the road. Troy’s win leaves the Trojans and Tippecanoe tied in the loss column with the Aviators (11-2, 6-1) a game back. Butler’s only scoring opportunity in the first half came at the 29:30 mark when Chris Mitrousis took a direct kick from about 15 yards out that banged off the cross bar. 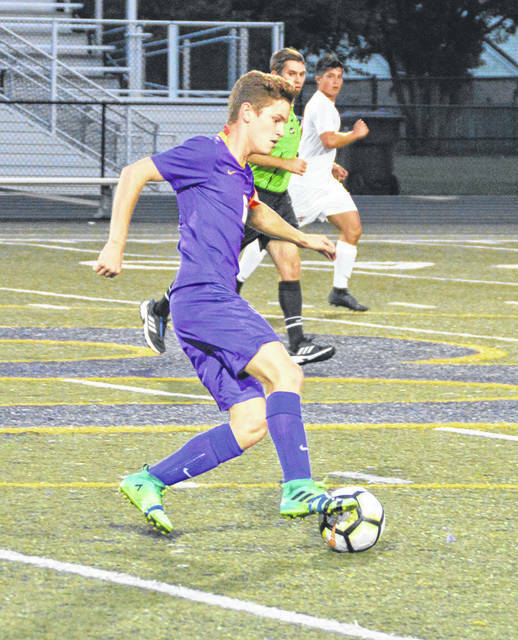 Troy kept the pressure on the Aviators throughout the first half and finally the Trojans’ Joey Sheehan broke through after a throw in from the right side. Butler put a little more pressure on the Troy defense with a pair of shots including a Zane Burgmeier shot off the cross bar with 13:00 to play and a free kick with just over 10 minutes to play. Neither found paydirt. Troy narrowly missed an opportunity for a second goal with two minutes to play when Jon Hipolito had a clear shot from the right side about 10 yards out. 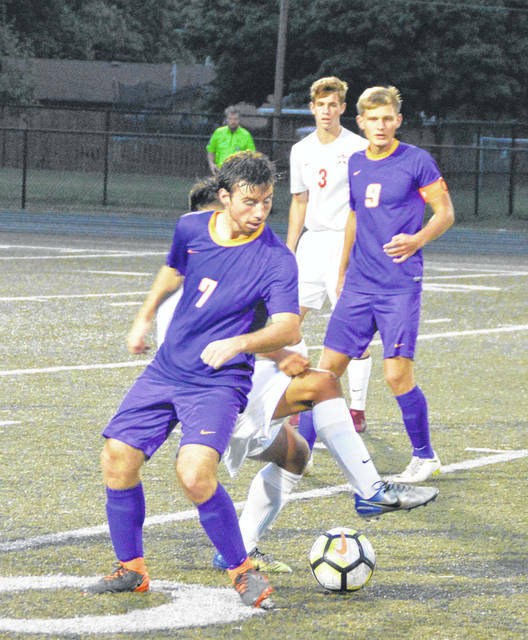 It sailed high, and Troy’s defense held over the final seconds of the match. Butler will strive to keep pace in the league race on Tuesday when they host Sidney on Senior Night. That contest is set for 7:15 p.m.